Some TV crime dramas have given people the idea that you have committed a crime, or are suspected of having committed one, the police will come knocking on your door post haste with a warrant and your Miranda Rights on the tip of their tongue. The reality is that it’s not unusual for people to spend a long time completely oblivious that there is a warrant for their arrest. The trouble is, while the police may not show up at your house or place of employment to arrest you, if you have an outstanding warrant then you’re still in trouble. To help people avoid being taken by surprise, here are some tips from us at the offices of Greg Nelson on how to handle an outstanding warrant for your arrest. It might seem like it would be obvious when you have committed a crime, or when a warrant would be issued, but it’s not always straightforward. A common situation is people missing court dates for minor offenses that might not have required a warrant, like a traffic citation. It’s that kind of thing people just overlook but doing so is enough to have a warrant issue. So be mindful of things like court summons. 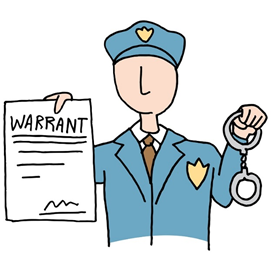 If you are reasonably sure a warrant exists for your arrest, but it seems like the police haven’t acted on it to arrest you, that is not a good reason to ignore it. That can only make matters worse. In those instances, address the warrant as soon as possible, ideally by contact a lawyer before going to the police. The first thing you should do if you know you have a warrant is secure legal counsel. Right after that, anticipate other potential costs associated with handling the arrest and possible court time, such as bail. Greg Nelson understands how confusing, upsetting, and even frightening it can be to learn you have a warrant out for your arrest. But we also know exactly how to handle it. We can help you in every step of the process, from discovery, to arrest, to court appearances and more. Contact us today to learn more, or to receive a consultation.